ITIL is best practice in IT Service Management, acknowledged as the most widely accepted approach to IT service management in the world. Innate Labs provides a comprehensive, consistent and coherent set of "best practices" focused on the management of IT service processes while promoting a quality approach to achieving business effectiveness and efficiency in the use of information systems. The ITIL certification workshop is designed for IT Managers, IT Support Staff, IT Consultants, Key Business Users, and IT Developers. 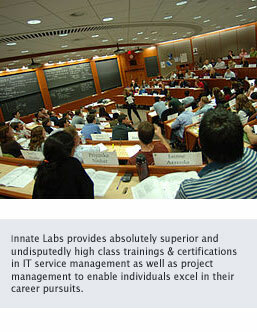 Innate Labs has a proven track record of 100% success rate till date and has successful conducted ITIL Training in Ahmedabad, Vadodara, Surat, Mumbai, Bangalore, Pune, Hyderabad, Delhi as well as International locations including UAE, Saudi Arabia, Singapore, UK, Australia, United States as well as Switzerland. All candidates who have gone through the certification training have cleared the exam and have been awarded with the ITIL 2011 Certificate from Axelos - UK. PRINCE2® (an acronym for PRojects IN Controlled Environments) is a de facto process-based method for effective project management. Used extensively by the UK Government, PRINCE2 is also widely recognised and used in the private sector, both in the UK and internationally. The PRINCE2 method is in the public domain, and offers non-proprietorial proven best practice guidance on project management. Innate Labs' extensive training & certification programs with real life scenarios and role plays not only assures individuals of clearing the certification exam but also enables individuals to embrace the project management challenges of today's world. The programs are designed and accredited by Axelos - UK adhering to best international standards in training & knowledge industry. The Project Management Professional (PMP)®program is designed to lead the participant to an internationally recognized certification from the Project Management Institute (PMI)® - USA. Innate Labs provides unique blended programs designed by industry experts to achieve PMP certification with ease and flexibility. The programs are available in Instructor-led mode as well as e-learning mode enabling PMP aspirants to get the flexibility of preparing for PMP certification. DevOps is an ideology which enables development & operations teams to integrate and deliver enhanced value to business. DevOps principles are the core of enforcing tighter collaboration among the delivery teams while ensuring compliance to stricter industry regulations & standards including segregation of duties. Innate Labs is one of the foremost implementation & consulting provider in this domain and now has embarked towards providing the qualifications, know-how as well as implementation expertise of DevOps principles. The DevOps certification programs are structured in to Preliminary, Intermediate & Expert paths, providing individuals & teams with planned approach to improving their business outcomes. PRINCE2 Agile is the only method available which bridges the best of both worlds (i.e. standardized project management methodology with agile ways of project delivery including Scrum & Kanban) The method describes how to configure and tune PRINCE2 so that PRINCE2 can be used in the most effective way when combining it with agile behaviours, concepts, frameworks and techniques. Innate Labs is one of the first training provider to be officially accredited for PRINCE2 Agile methodology and relevant training programs. The learning pedagogy is structured around practical agile delivery needs and challenges which enables delegates to adopt and adapt the PRINCE2 framework in agile context. ISO/IEC 20000 is an international standard that allows organizations to demonstrate excellence and prove best practice in IT service management. The standard allows IT service provider organizations to achieve conformance to a service management system that requires them to continually improve their delivery of IT services and aligns with the ITIL best practice framework. Innate Labs' best-in-class ISO training & certification programs with practical learnings provides individuals and organization achieve a competitive differentiator for tendering and procurement as well as ensure IT service management practices are ready for the scrutiny of internal and external audits. ICTP is a software testing training & certification program that demonstrates a proficient level understanding of software quality testing methodology & principles which includes software test automation. The program equips individuals with latest knowledge in testing domain enabling them to excel in their IT career. In addition, the participant has an option to choose additional modules on Certification Preparatory Training for internationally acclaimed testing certifications like ISTQB® , CSTE®/ CMST®. Advanced software testing certification (Certified Test Analyst) equips testers to adapt advance challenges in testing domain. ICTA is a training & certification program in software testing that demonstrates a advance level understanding of software quality testing methodology & principles which includes software test automation. The program equips individuals with latest knowledge in testing domain enabling them to excel in their IT career. In addition, the participant has an option to choose additional modules on Certification Preparatory Training for internationally acclaimed testing certifications like ISTQB® advanced Test Analyst , CSTE®/ CMST®. Improve your business efficiency. Choose us to adopt and implement ITIL based effective IT service management.